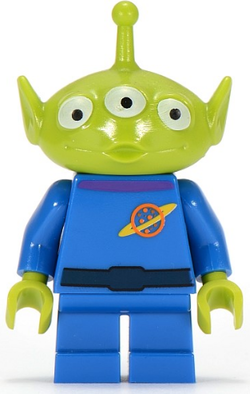 Aliens are small three-eyed minifigures from the Toy Story theme. The Alien has a green head and green hands, with a bright blue torso and short legs of the same colour. The head is a new mould, wide with three eyes and a single antenna on top. Printing of a planet and a belt is on the torso. In different variations, blue and yellow splotches are also present, along with a scuff mark. This is a description taken from LEGO.com. Please do not modify it. Adopted by the Potato Heads, the three green squeak-toy aliens are quick to remind Mr. Potato Head that he saved their lives and they are eternally grateful. Facts about "Alien (Toy Story)"
This page was last edited on 10 February 2019, at 00:18.